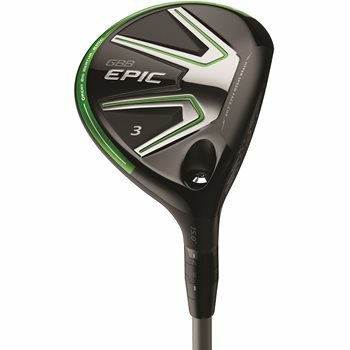 The Callaway Great Big Bertha Epic fairways are exceptionally easy to launch and provide the player with great distance. Incorporating Callaway’s triaxial carbon composite material, the Epic fairway’s crown comes in at 5.8g, 78% lighter than a standard steel crown. They’ve redistributed the weight in strategic locations to lower the CG and increase MOI for a forgiving and powerful launch. The Epic also includes Hyper Speed Face Cup technology, a thin and flexible rim around the inner side of the face which flexes and releases more uniformly and efficiently at impact for higher ball speeds. Callaway’s Speed Step technology which enhances the head aerodynamics results in faster club head speeds.